A regular breeding resident widely distributed throughout the state but most common in the east-central, north-central, and northwestern regions. Most Minnesota birds remain through the winter months where open water is available. Trumpeter Swans were a common species during the Minnesota Breeding Bird Atlas (MNBBA). Although the original extent of its breeding range is not entirely known, the Trumpeter Swan formerly occupied much of the north-central United States and Canada, from the Great Lakes west to British Columbia and southern Alaska. 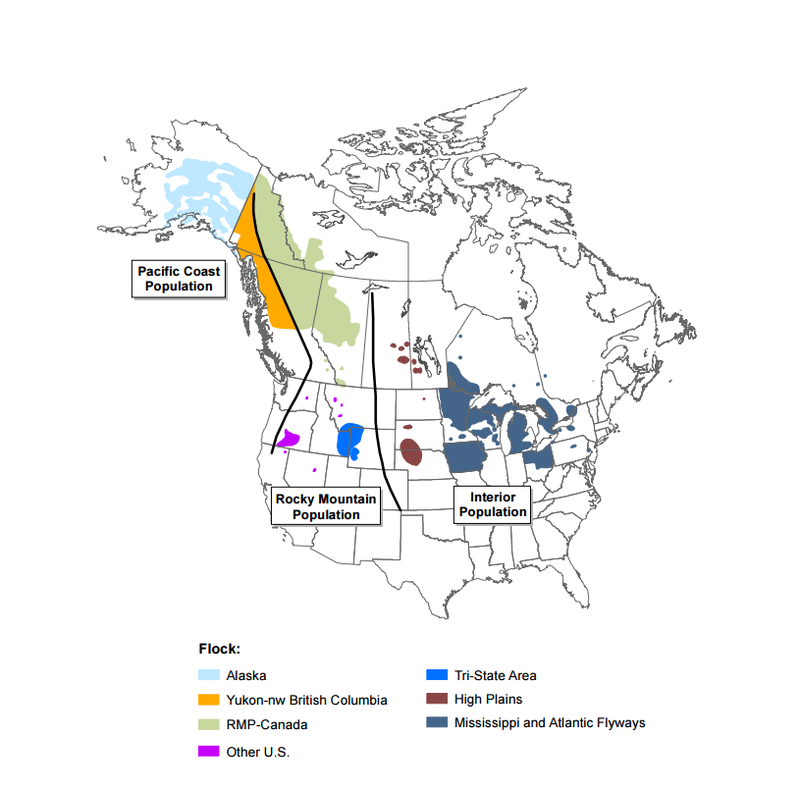 Today its distribution is quite fragmented, with populations in Alaska and western Canada, the Rockies, the Central Plains, and the Upper Midwest (Figure 1). Assigned a Moderate Continental Priority by the North American Waterfowl Management Plan, and assigned a Continental Concern Score of 12/20 by Partners in Flight. Formerly extirpated, but now classified as a Minnesota Special Concern Species and a designated state Species in Greatest Conservation Need. The Trumpeter Swan has also been designated a Minnesota Stewardship Species by Audubon Minnesota. Short-distance migrant. The vast majority of Minnesota’s breeding population migrates only as far south as central and southern Minnesota to sites where there is open water and an abundant food supply. Two power plant sites now offer some of the best opportunities for Minnesota’s wintering swans: Xcel Energy’s Monticello Nuclear Power Plant along the Mississippi River, and Otter Tail Power Company’s coal-fired power plant in Fergus Falls, located along the Otter Tail River. Indeed, the former has become a winter destination site for viewing thousands of Trumpeter Swans, which are attracted by the site’s open water and local efforts to feed the birds. Largely herbivorous, feeding on submerged and emergent aquatic vegetation during the summer; during the winter birds may forage in agricultural fields for leftover small grains. A large platform floating on water or placed on a mound of vegetation or on an island within a wetland. Current Distribution of the Trumpeter Swan in North America (from Groves 2017). When Roberts compiled his treatise on Minnesota birds in 1932, he wrote, “The days of the Trumpeter Swan as a bird of Minnesota have long since passed.” He believed that prior to the late 1800s, it was a breeding resident throughout the grasslands and sparsely wooded regions of the state. Breeding records (nests and young) were available from Heron Lake in Jackson County (1883), Everson Lake in Meeker County (1884 or 1885), Pike Lake in central Minnesota (1853), and Swan Lake in Nicollet County (1823). The birds on Swan Lake were reported by G. C. Beltrami, who was part of the Long Expedition to the territory in 1823. Keating, the expedition’s historian, reported that the Sioux Indian name for the lake, Manha tanka otamenda, meant Lake-of-the-Many-Large-Birds, no doubt in reference to the long-time tradition of the Trumpeter Swans nesting there (Roberts 1932). The disappearance of the birds in Minnesota was not unique. By 1932 the population was on the verge of extirpation in the lower 48 states. Only 69 birds remained in and near Yellowstone National Park (Baldassarre 2014). Any further accounts of the species’ presence in the state were absent until 1965, when a provocative article by Robert Turner, titled “Will Trumpeter Swans Return to Minnesota?” appeared in the statewide ornithological journal The Loon (Turner 1965). Turner questioned whether some recent summer records of Whistling Swans (now known as Tundra Swans) were actually Trumpeter Swans. Trumpeter Swans had been introduced to Lacreek National Wildlife Refuge (NWR) in southwestern South Dakota, and he argued that vagrants from that population could already be showing up in Minnesota. Lacreek NWR was the first location in the Great Plains to receive 20 cygnets from the Red Rock Lakes NWR in Montana in 1960. Additional releases in 1961 and 1962 resulted in a steadily growing population on the refuge and in the vicinity. Turner urged the U.S. Fish and Wildlife Service to establish a breeding population in Minnesota. In 1966, the Hennepin County Park Reserve District (now the Three Rivers Park District) began experimenting with the reintroduction of Trumpeter Swans to the county’s park reserves. Their long-term goal was to establish a free-flying population of at least 100 birds, with 15 breeding pairs, within the district and throughout south-central Minnesota (Gillette 1986). Forty swans were secured from the Red Rock Lakes NWR, but initial efforts to simply release the birds proved unsuccessful (Gillette 1974). The tide turned when the district initiated its own captive breeding program, caring for the young cygnets and not releasing them until they were two years old. The first release of young raised by this program occurred in 1978, and the first successful nesting occurred in 1979 (Minnesota Department of Natural Resources 2016a). By 1996, more than 245 young birds had been raised and were successfully nesting within the park district and beyond. One pair released from Lake Rebecca Park Reserve in 1983 was responsible for the first successful nesting in northern Minnesota in over 100 years. The birds nested just north of Grand Rapids in Itasca County in 1986 (Kittelson 1996; Gillette 1986). The park district’s successful program continued another 13 years, until it was retired in 2009. In 1982, the Minnesota Department of Natural Resources outlined an initiative to build on the work of the park district by reintroducing birds in northwestern Minnesota, working collaboratively with state and federal agencies, provinces, universities, tribes, and the Trumpeter Swan Society. Kittelson (1996) and Henderson (2017) provided comprehensive overviews of the initiative. Briefly, eggs were acquired from Red Rock Lakes and Lacreek NWRs, from the Minnesota and Brookfield Zoos, from private propagators, and from the state of Alaska. The birds were reared at the Carlos Avery Wildlife Management Area in Anoka County until they were two years old, and releases began in 1987 near Tamarac National Wildlife Refuge in Becker County. Releases would continue for more than 20 years, not only at Tamarac NWR but at additional sites in northwestern Minnesota as well as farther east in Itasca and St. Louis Counties, on Swan Lake in Nicollet County, and on Heron Lake in Jackson County. By 1998, Hertzel and Janssen had confirmed nesting in 6 counties since 1970: Aitkin, Becker, Carver, Hennepin, Hubbard, and Polk. The 1986 Itasca County nesting was not included because it was an observation of an adult pair with 4 cygnets, which did not meet the definition of a confirmed nesting record by the Minnesota Ornithologists’ Union (Hertzel and Janssen 1998). By 1999, more than 75 breeding pairs had become established in the state. A winter survey in 2011 documented a statewide population of over 5,500 birds, and a comprehensive breeding season survey in 2015 found more than 17,000 individuals (Henderson 2017; Minnesota Department of Natural Resources 2000, 2011, 2016b). Due to similar restoration efforts elsewhere in the United States, Trumpeter Swans are now found in many portions of their former breeding range (Figure 1). From 2009 to 2013, when the MNBBA was conducted, participants reported 1,173 Trumpeter Swan records in 16.0% (772/4,832) of the surveyed atlas blocks and in 14.6% (341/2,337) of the priority blocks. Breeding evidence was gathered from 244 (5.0%) of the atlas blocks (Figures 2 and 3; Table 1). The birds were most abundant in the western portions of the Laurentian Mixed Forest Province, south of the expansive peatlands, and were least abundant in the Prairie Parkland and Tallgrass Aspen Parklands Provinces of western Minnesota. They were reported in 72 of Minnesota’s 87 counties and were confirmed breeding in 55 counties! It has been a remarkable recovery for a species on the brink of extinction in the early 1900s, a result of the dedicated efforts of local, state and federal resource agencies, tribes, and conservation organizations throughout Minnesota. Similar efforts have led to the species’ recovery elsewhere within its historical breeding range, including in Wisconsin, Iowa, and Michigan. Breeding distribution of the Trumpeter Swan in Minnesota based on the Breeding Bird Atlas (2009 – 2013). Summary statistics of observations by breeding status category for the Trumpeter Swan in Minnesota based on all blocks (each 5 km x 5 km) surveyed during the Breeding Bird Atlas (2009-2013). Summary statistics for the Trumpeter Swan observations by breeding status category for all blocks and priority blocks (each 5 km x 5 km) surveyed during the Minnesota Breeding Bird Atlas (2009-2013). Throughout their breeding range, swans utilize a variety of freshwater wetland habitats, including marshes, ponds, shallow lakes, and, occasionally, slow-moving rivers. Quiet bays of large lakes also may be used. The actual size of the site seems less important than the following criteria: sufficient open water to enable the birds to become airborne (approximately 100 m or more), abundant aquatic plants for foraging, stable water levels, good water quality, suitable structures or vegetation for nesting (e.g., muskrat or beaver houses), and limited human disturbance (Figure 4; Baldassarre 2014; Mitchell and Eichholz 2010). Productivity of nesting swans often is higher in sites that have irregular shorelines, are shallow (<1.2meters deep), and support a diverse and abundant community of aquatic plants. Studies suggest sites that provide multiple nesting opportunities and open water early in the season are preferred (Mitchell and Eichholz 2010). A field study conducted in northern Minnesota in 2007 and 2008 found swans preferred smaller wetlands and lakes (<60 acres) with extensive forest cover along at least 75% of the shoreline and shallow beds of cattails, which provide tubers for feeding. Such sites were typically less disturbed by shoreline development and recreational boat traffic (Henderson 2017). Typical breeding habitat of the Trumpeter Swan in Minnesota (© Lee A. Pfannmuller). Since 1968, the U.S. Fish and Wildlife Service has coordinated the North American Trumpeter Swan Survey. Following the initial survey in 1968, the second one was conducted in 1975, and it has been repeated every five years since. Cooperators include federal, state, and provincial resource agencies and individuals across both the United States and Canada. Regions can establish their own survey design but are encouraged to address several overarching goals, including providing an estimate of annual reproductive success. The most recent survey data are available for 2015, when the continental population of Trumpeter Swans was estimated at 63,016 birds, an increase of 63% since the previous survey in 2010 (Figure 5). The estimated annual growth rate since 1968 was 6.6%, an exponential rate of population growth (Groves 2017). Range-wide the population has expanded so quickly that the expense of the survey is now a challenge for many of the cooperating agencies. The 2015 statewide survey data for Minnesota yielded a statewide population estimate of 17,000 birds (Minnesota Department of Natural Resources 2016b). This represents more than a 200% increase over the 2010 estimate of 5,550 birds (Minnesota Department of Natural Resources 2016a). In the central United States, including Minnesota, wetlands usually support only one breeding pair; farther north and west they may support multiple pairs. As the population size continues to increase in the interior, lakes may eventually support more pairs. Territories range in size from as small as 1.5 ha to more than 100 ha (Baldassarre 2014). 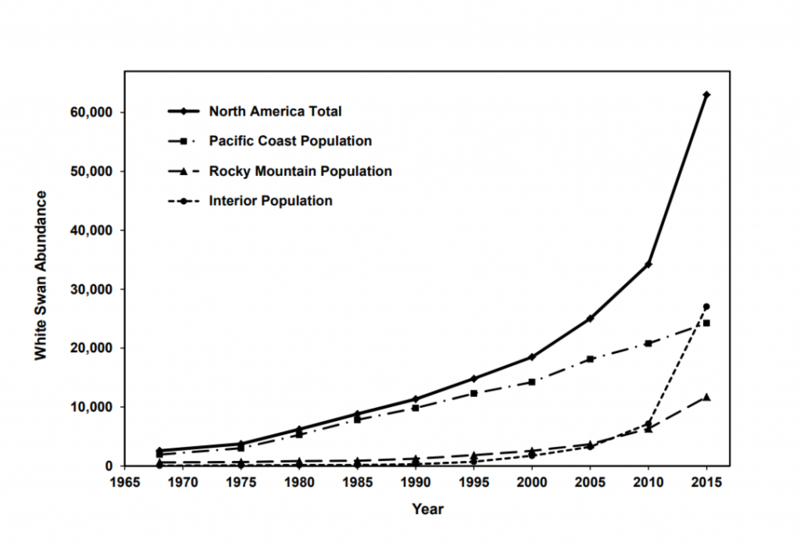 Trends in the abundance of adult and subadult trumpeter swans (“white swans”) in the Pacific Coast, Rocky Mountain, Interior, and total North American populations, 1968-2015, from the North American Trumpeter Swan Society (from Groves 2017). The recovery of the Trumpeter Swan is truly a conservation success story. In Minnesota, the species was officially classified as an Extirpated Species in 1984, when the first state list of Endangered and Threatened Species was published. In 1996 it was downgraded to Threatened status, and in 2013 downgraded again to Special Concern status (Minnesota Department of Natural Resources 2012). It is listed as a Species in Greatest Conservation Need in the state because Minnesota supports 27% of the North American population (Minnesota Department of Natural Resources 2015). Audubon Minnesota also designated it as one of 12 Minnesota Stewardship Species based on significant size of the state population (Pfannmuller 2012). At the national level, the Trumpeter Swan has been assigned a Moderate Continental Priority by the North American Waterfowl Management Plan (2004) and a Continental Concern Score of 12/20 by Partners in Flight (2017). During the course of the recovery efforts, there were numerous setbacks that clearly point out many of the risks that still confront the species. The most significant is lead poisoning. When the birds tip up and forage for tubers and roots among the bottom sediments, they can easily ingest lead shot and lead sinkers. Although lead shot has been banned for waterfowl hunting since 1991, wetlands that were popular waterfowl hunting spots may have decades of accumulated spent shot in their sediments. From 1986 to 1989, the University of Minnesota’s Raptor Center documented that approximately 40% of the Trumpeter Swan fatalities in the state were the result of lead poisoning (Degernes and Frank 2013). Whether that level of mortality persists is unknown. The Raptor Center still receives dead swans but only about 10 birds per year are submitted (D. Larson, pers. comm.). Other risks to local populations include collisions with power lines, illegal shooting from vandalism or misidentification with snow geese, human disturbance during the nesting season, and the loss and degradation of wetland habitats. Because the Trumpeter Swain is a wetland-dependent species, the potential impacts of climate change are a concern, since wetlands, particularly in the interior of the United States and Canada, are considered at risk as temperatures continue to rise. “The State of the Birds 2010 Report on Climate Change” (North American Bird Conservation Initiative 2010) assessed the Trumpeter Swan’s risk as low. A more recent assessment by the National Audubon Society, however, classified the species as “climate endangered” based on models that predicted the species could lose approximately 67% of its current winter range by the year 2080 (Langham et al. 2015; National Audubon Society 2016). Although Minnesota’s Trumpeter Swan population is growing at an unprecedented rate, there are clearly threats that could impact current and future populations. History has shown repeatedly that one should never take a species’ abundance for granted. Degernes, Laurel A., and R. K. Frank. 1991. “Causes of Mortality in Trumpeter Swans Cygnus buccinator in Minnesota 1986–1989.” Wildfowl Supplement 1: 352–355. Gillette, Laurence N. 1974. “Status of the Trumpeter Swan in Minnesota.” Loon 46: 169. Gillette, Laurence N. 1986. “Trumpeter Swans Nest in the Chippewa National Forest.” Loon 58: 194. Henderson, Carroll. 2017. “Visions of Swans.” Minnesota Conservation Volunteer 80(Mar/Apr): 8–21. Kittelson, Steve. 1996. “The Return of a Giant in the Bird World to Minnesota.” Loon 68: 81–85. Minnesota Department of Natural Resources. 2011. “Minnesota Trumpeter Swan Population Tops 5,500.” News release, January 20. Pfannmuller, Lee A. 2012. Stewardship Birds of Minnesota: Our Global Responsibility. St. Paul, MN: Audubon Minnesota. Turner, Robert E. 1965. “Will Trumpeter Swans Return to Minnesota?” Loon 37: 122–126.